This morning I woke up, had some breakfast, drank some coffee, waited for the rest of my family to wake up, then voted. There was no line at 8:30am. My three-year-old daughter helped me decide who to vote for. My nine-year-old son son wanted to inspect my ballot to compare my ballot to my wife’s. I don’t consider this voter intimidation, just curiosity. The Freakonomics podcast made the case a while ago that your vote in the presidential election is essentially meaningless. I buy that from a mathematical perspective, but not from a cultural perspective. Casting a vote one way or another is meaningful. You’re buying into a particular vision of the next four years, or you’re so repelled by one side that you need to vote against it. In this campaign, there was plenty that was repellent. It’s fascinating to watch the mental gymnastics that we all make to justify choices we likely made a long time ago. It’s like a nation-wide experiment in the effects of cognitive dissonance (i.e. clinging strongly to a belief despite seemingly little reward for doing so). I’ll admit, I made my choice for president a long time ago, and nothing I’ve seen since then has caused me to change my mind. In fact, every news cycle reaffirms my choice. Here in Massachusetts it’s pretty much taken as a given who will win our electoral votes, unless we’re so into “Cat Scratch Fever” that Ted Nugent can make our voters change their minds. Actually, “Cat Scratch Fever” is a terrible song, so cat scratch that, I guess. I wonder how much entertainers actually move the needle on Election Day, but that’s another topic for people with far more time on their hands as well as access to the data. But then who trusts actual data anymore when you can find a news outlet that echoes your beliefs. 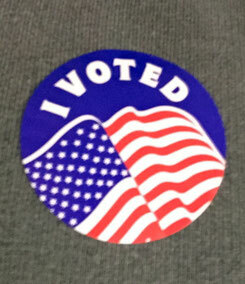 There are other races as well as ballot questions that made it worth my time to go the 1.7 miles to my polling station (Town Hall). I’m fortunate that voting is not a huge inconvenience, and I get to share it with my children. So, nothing to complain about for me. Since I didn’t voice any political ads this election season, my conscience was clear in my choice, and no cognitive dissonance necessary. Tomorrow, I’ll still have my voiceover business, and, likely a new president-elect. Now, get out there and do your thing: vote!